This is a post I've been meaning to write for quite a while and have just never gotten around to! Well.... here goes, the latest in my series: MM guide to Oman. 1. Plastic water bottles. 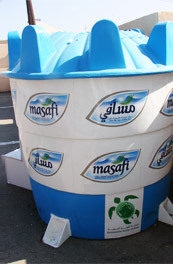 Masafi & Tanuf, and the Environmental Society of Oman have an active plastic bottle recycling program - rumour is that the recycling plant in the UAE is unable to accept the bottles currently, and so the bottles are being shredded and baled and stored until such a time that the UAE will allow the plastic refuse to be transported over the border for recycling. This may be old news, I've not heard an update to this in over a year. 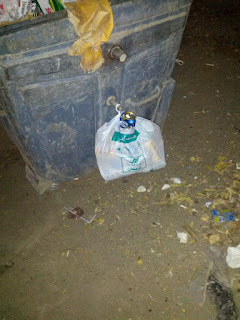 There are collection bins dotted all over the Capital, I personally use the one at the ABA school in Al Khuwair. 2. Paper. Apex publishing, the people behind Muscat Daily, The Week and a bunch of other publications, operate a paper recycling operation. They will come to your location (for volumes significant enough) to collect the paper, or alternatively there are a few collection bins around town - again I personally use the one at the ABA school in Al Khuwair. 3. Aluminium cans. Basically soda cans - not steel cans that are used for soups and such, but the aluminium ones. I'm not really 100% sure what happens with them, but there is an active group of people (at least here in Muscat) that will go around from bin to bin and collect the pop cans. I'm told they sell the cans by weight to "takers" who take the cans back to India on ships on return voyages for recycling there, and also I've heard the cans are sold to truck drivers heading back to the UAE, where apparently there are also takers who pay for the empty cans. Either way, if you separate your cans into a bag and leave them outside a dumpster, in less than an hour it's usually been picked up by someone. 4. 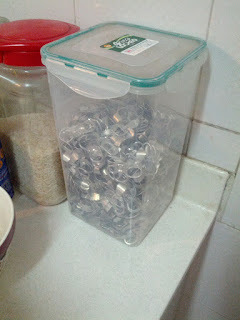 Can ring-pulls. Yes the canning plants here are still using older machines that have the detachable ring pulls that went out of fashion in many other countries years ago for the number of broken nails and amount of litter they cause! Even the UAE has the newer style cans with the ring pulls that stay attached to the can. But, there's a silver lining, and that is that most of the expatriate schools in town run collections for these ring pulls, which are made from a high quality aluminium. The ring pulls are collected by a girl at the TAISM school, Tara Mary Aziz and donated to a charity in Thailand that melts them down and makes prosthetic limbs from them. Thats about it, there is the charity shop run haphazardly by the Dar al Atta charity which is down in Ruwi which accepts all sorts of things - clothes, furniture etc, and there are numerous book sales run by various different groups (my two favourites are the Dar al Atta Lets Read campaign, and the Oman Cat-Astrophy expat-run animal spay and neutering program). So, hopefully you will think the next time you throw a can in your trash, and try and reduce the amount of waste you personally generate - remember, every little helps! I'm not aware of any other domestic recycling programs in town, if I've missed something please let me know by commenting here or dropping me an email! I have been worried about the plastic getting thrown, may I know please, the location of this school in Alkhuwair that has the collection bin? Hi I have recently moved to Muscat and I am looking for recycling bins around al seeb but so far I don't see any.. Which material recycling in Oman?